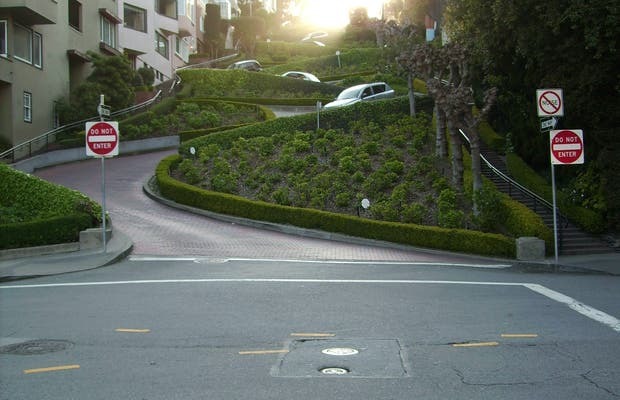 Although San Francisco is certainly famous for its hills, Lombard Street takes the cake and is a tourist attraction in itself. It has an inclination of 27 degrees and is considered to be the world's most windy street. It's located on Russian Hill and connects Hyde and Leavenworth streets (one block!). Both pedestrians and cars can pass. It is quite a sight to see cars making an "s" shape down the street. It has 10 curves in a "zig-zag" shape and you can only go downhill. It is decorated with flowers and is a great photo-op. Perfect place to have an amazing picture. Great views and the houses. Driving down the crooked street is one of those things to check off your bucket list! This the world's most crooked street and worth driving down.